Tucked underneath a block of apartments, Grand Lafayette is easy to miss – but its $33 all-you-can-eat menu, with unlimited karaage chicken and pork belly bao, is worth seeking out. Solar Liang and Monique Wu met as students with a shared love of coffee. 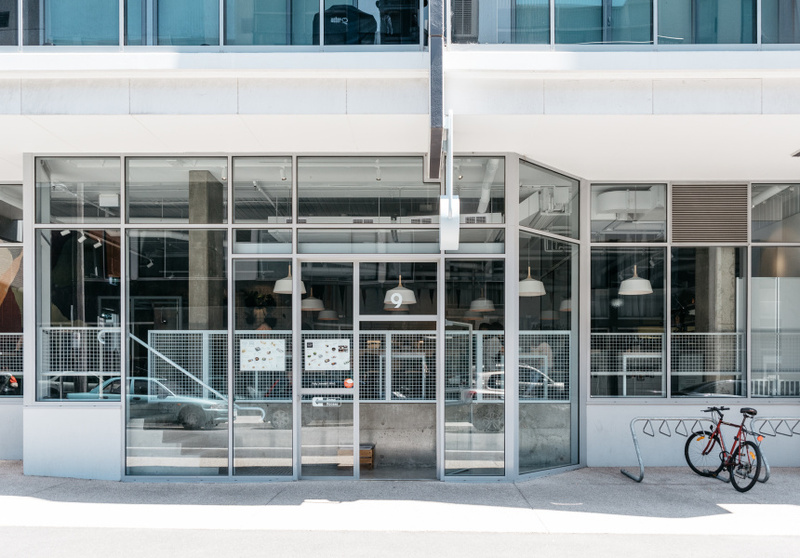 They opened their first business, the cosy Cafe Lafayette on Port Melbourne’s beachfront, in 2015. Recently, though, they started to feel they’d outgrown their little 40-seat space. "It was a bit small. We started as a family business, and we had a very good start and the business was going very well,” says Liang. “But we wanted a bigger place to accommodate customers." This led them to open Grand Lafayette, a colourful all-day Japanese eatery in a quiet side road just off High Street, Prahran, about midway between Humming Puppy yoga and The Smith. It’s tucked underneath a new-ish apartment block, and blends in – it’s easy to walk right by. This doesn’t worry Wu, though. “If you're good, people will find you,” she says. The diner is headlined by an all-you-can-eat dinner menu. For $32.80 you can load up on chicken kaarage with black chilli vinegar, bao stuffed with fall-apart pork belly and kimchi-infused teriyaki sauce, salmon tataki with sweet potato chips, and 48-hour slow-cooked Black Angus steak. In the sushi line-up, the tuna maki is a fun standout. It’s a roll filled with tuna, cream cheese and sakura flakes (made from freeze-dried cherry blossoms), sliced and coated in tempura batter before being deep-fried. This isn’t sushi as you know it. "A formal Japanese chef wouldn't do sushi this way,” says Wu. “They'd do it in a very tidy, very formal way." There’s no hint here of the rigid perfectionism and stark minimalism so often associated with the cuisine. At Grand Lafayette the food leans more toward the Jackson Pollock side of things, with sauces and dressings splattered and smeared beneath bright and vivid asymmetrical arrangements. The drinks menu is a playlist of hits from the couple’s first eatery. Over-the-top Freaky Shakes are amped up with made-for-Instagram ingredients such as candied popcorn, mini Kit Kats, pretzels and Nutella. Barely-set blobs of jelly topped with flavoured syrups (rose, green tea, mint or straight up brown sugar), known as “Raindrop Cakes”, also survived the move. 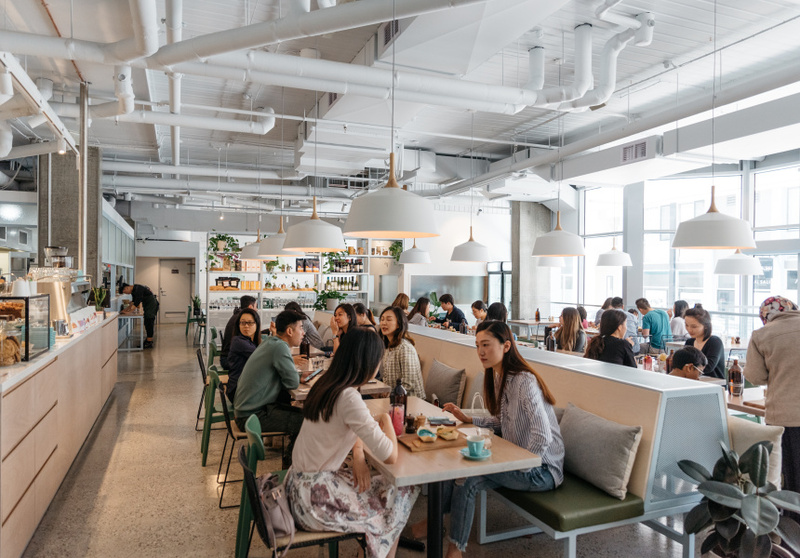 As for the interior, Wu and Liang spent nine months trying to nail the overall aesthetic, finally landing on a seaside-in-the-city vibe (“We want people to think of the ocean when they come here"). The lofty ceiling leaves most of the pipes bare, with the majority of the light coming from the floor-to-ceiling windows that make up the front wall. 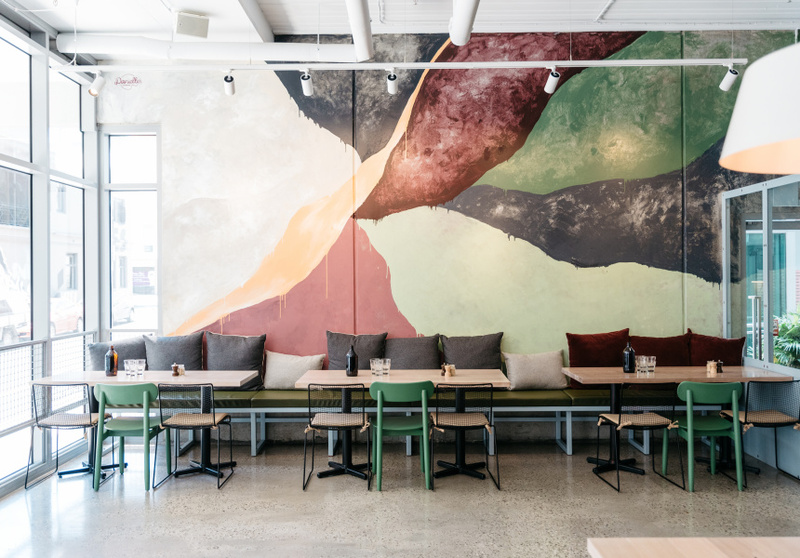 Murals by artist Danielle Weber adorn the walls – one inspired by latte art, and the other a map of the world – but that’s about it. Much of the concrete is left bare, with a few potted plants hanging from steel grills. It’s simple, but far from plain. Industrial but inviting.